Hope I have a partner too. Finally finished doing this wall from something to nothing basis which means no stocks and scans except my pencil outline. Well I wanna help a group for a bit. Awww! This is so cute! I love TenTenXNeji and I love how Sakura came out here! The line art is a bit shaky, though. 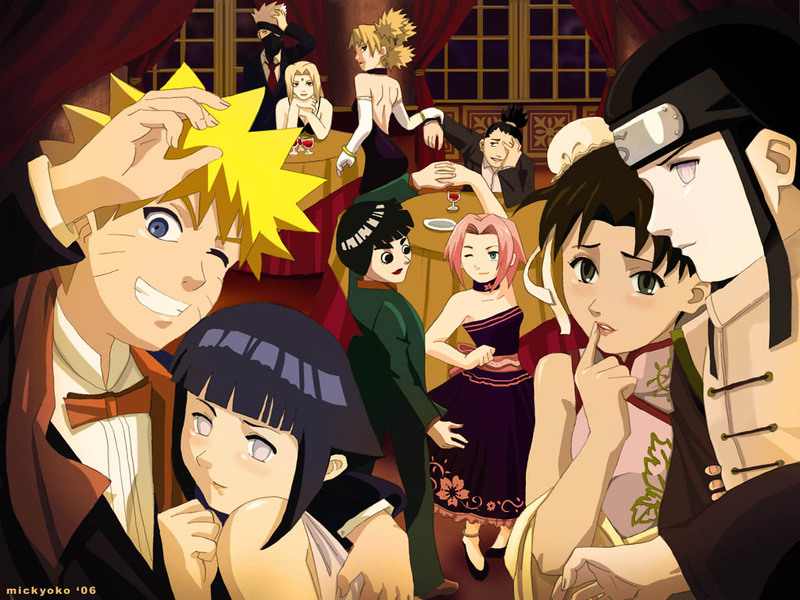 I personally like the jod you did with Naruto & Hinata. As far as Sasuke goes, lets just assume that he's with Gara & Kabuto terrorizing some small village. Good work. Nice work! I love the entire idea of your wallpaper and the coloring is awesome! There is though, one thing that doesn't seem right; and that's Lee's face. It looks...strange. Good work with everything else though. Hehehe. This sounds cool. I wish I can join the party! luv it! XD hinata and naruto are soooo cute together! but tenten and neji? i think not, since she likes lee. Awsome wall, absolutely love it. Pity about the resolution. I don't suppose you could produce a higer resolution version from your originals without killing the quality? Cause that would great. Impressive art! Even the background of the ballroom is neat and matching. You really got the characters down, and the hands are impressive too. Great work! whoa keep more coming, i love this :D.
I like it me and my friend said"sasuke-kun?" We love sasuke! great wallpaper i love it i envy no hinitaxneji just kidding! but i do love it!